Metal alligator hair clips are use to clip hair bows and hair accessories in the hair. 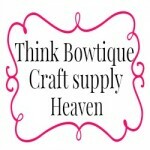 At Think Bowtique you will find both double and single prong hair clips. Need to purchase a small quanity or bulk hair clips we can help. If your going to line your hair clips you will need 9mm grograin ribbon. We stock a huge range of colours in the 9mm grosgrain ribbon so you are sure to find a colour to match your project. You might also like to add a triple flip grip hair clip grips to your hair clip to ensure the hair clip stays put in fine hair.